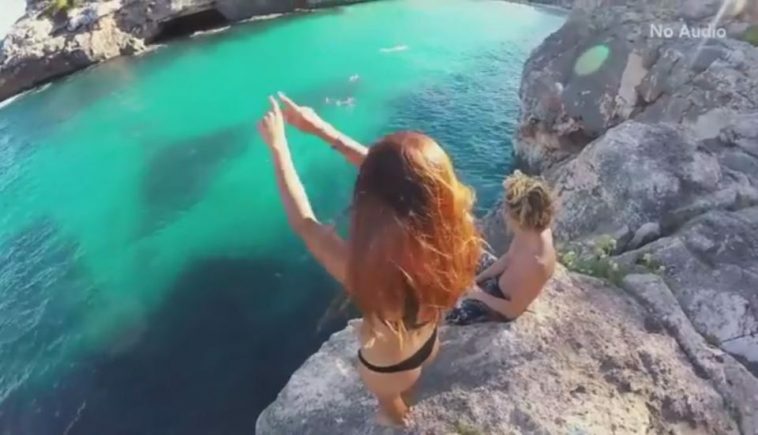 Home comedy entertainment fun Girls Guys Interesting nature news recent slider video viral4real Boyfriend Lets His Girlfriend Fall Off a Cliff.. Sparks Online Debate and Outrage! Boyfriend Lets His Girlfriend Fall Off a Cliff.. Sparks Online Debate and Outrage! The girl was about to jump when she suddenly changed her mind, but it was too late. To stop herself from falling, she tries to grab onto her boyfriend’s ankle. To everyone’s shock, the boy avoids his girlfriend’s desperate grasp, and lets her fall into the water. First of all the girl is safe and she was not injured! Everyone will love a weekend getaway, especially with their partner. If not everyone, lots of people love to go on trips and explore the world with their loved ones. In such a way, the adrenaline loving pair who set off on a romantic date, diving in these clear and beautiful waters. Unfortunately, their date ends in a shocking way which sparked outrage from netizens. In the video, the girl was about to jump when she suddenly changed her mind, but it was too late. To stop herself from falling, she tries to grab onto her boyfriend’s ankle. To everyone’s shock, the boy avoids his girlfriend’s desperate grasp, and lets her fall into the water. The video, which was posted on Reddit, sparked online debate regarding both person’s actions.